Color(s): solid black, brown, or gray, Coat: The Newfoundland has a water resistant double coat. The outer coat is coarse, flat, oily, and of medium length. The under coat is dense and soft in texture. The coat color is typically black, but may also be black with blue highlights, bronze, brown, or gray. Distinct feature: The Newfoundland is a sweet, elegant, and courageous breed. They are the embodiment of dignity and carry themselves in a stately and noble manner. The Newfoundland is a deeply devoted and extremely delightful companion. They are considered to be one of the friendliest breeds. Temperament: The New foundland is generous with love and affection. They are very sociable and friendly to visitors they know. They have a keen sense of responsibility and are excellent with children. They become so attached to their families that they cannot ever adapt to a new home or environment. They are generally good with other pets. This breed thrives on human companionship. They are gentle, heroic, and docile. 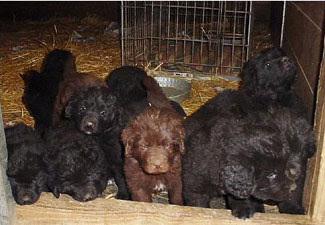 Newfoundlands are extremely protective and will place themselves between their family and any danger that appears to be of a threatening nature. Activity: They enjoy and benefit from play sessions, daily walks, and swimming. They are relatively inactive indoors. The Newfie will do okay in an apartment or condominium dwelling provided they are given sufficient exercise. They enjoy a run in a small fenced yard.